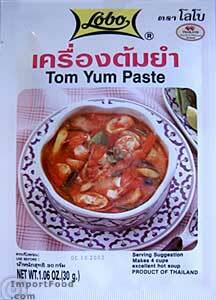 Make delicious and authentic "Tom Yum" soup soup with this high quality product imported from Thailand. Simply mix with water, your choice of meat, mushrooms, fish sauce or salt and lime juice. We also recommend adding one or two pieces of dried galanga to add flavor. A convenient envelope packet, enough to make 4 servings. Ingredients: salt, sugar, soyabean oil, spices, lemongrass, msg, citric acid. No colorings or preservatives added. Product of Thailand.